Over the years, traditional spark- and compression-ignition engines have helped power some of the transportation technology that we’ve relied upon the most, from automobiles and trains to airplanes and ships. But as transportation and other technologies using these engines have evolved, greater emphasis has been placed on reducing the emissions and improving the efficiency of fuel engines. This has not only prompted the optimization of conventional engines, but it has also encouraged the search for alternative engine types that could better meet growing environmental demands. One of the suggested alternatives is HCCI engines. Testing an automotive HCCI engine. Image by Combustion Research Facility. Licensed under CC BY-SA 3.0, via Wikimedia Commons. HCCI is a type of internal combustion in which auto-ignition of a homogeneous fuel-oxidant mixture is reached by a compression process. When compared to conventional engine types, HCCI engines have a lower operation temperature and generate a simultaneous combustion in the entire volume of the combustion chamber. Due to its uniform combustion process and relatively low temperature, the HCCI process emits less NOx and produces a cleaner exhaust. In this sense, HCCI engines deliver the best of both worlds, balancing the emissions of a gasoline-style engine with the efficiency of a diesel-style engine. While this technology shows great promise, there are some important challenges to overcome — one of which is ignition timing. In traditional engines, modifying the combustion timing is rather easy via engine control modules. The flameless combustion process of HCCI, however, makes maintaining control over the process a much more difficult task. By modeling the combustion process of an HCCI engine in COMSOL Multiphysics, you can better understand its ignition behavior and identify ways to optimize your control over it. 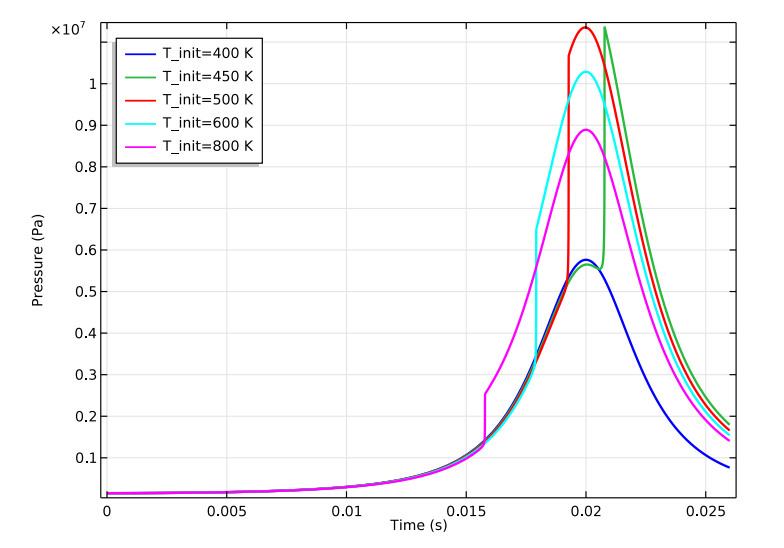 Let’s look at a tutorial model that illustrates this application, analyzing ignition trends as a function of initial pressure, initial temperature, and fuel additives. Before diving into the combustion process, let’s account for the homogeneous mixture that HCCI requires. While forming such a mixture with conventional diesel fuel is quite difficult (small droplets in air), natural gas fuels (all-gas phase) are able to quickly reach uniform conditions in the cylinder. These fuels are therefore a viable option for HCCI. With this in mind, we chose to consider the combustion of methane for our example. In this particular case, the methane combustion takes place under lean conditions, which means that an excess of oxidizer is supplied. To describe the reaction kinetics and thermodynamics of this mechanism, we used the GRI-3.0 mechanism, applying a reaction mechanism of 53 species participating in 325 reactions. Importing the respective data files into the Reaction Engineering interface in COMSOL Multiphysics made it easy to set up and access the necessary data for our problem. 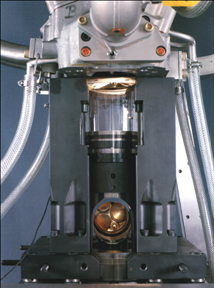 The model itself consists of a combustion cylinder featuring a perfectly mixed batch system of variable volume. This predefined reactor type is available as an option in the Reaction Engineering interface. The figures below show the engine cylinder as well as the key geometric parameters in its design. Here, D represents the bore, Lc represents the connecting rod, La represents the crank arm, and α represents the crank angle. The combustion cylinder and its respective geometric parameters. In this case, D is 13 cm, Lc is 26.93 cm, and La is 8 cm. Note that the speed of the engine is 1500 rpm. 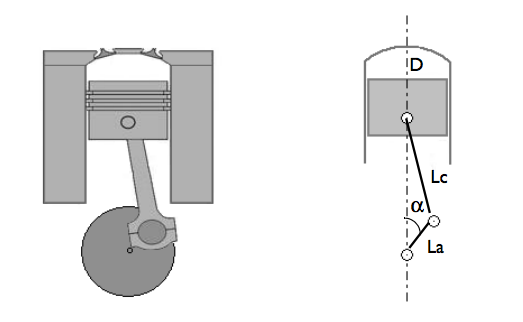 When calculating the cylinder volume as a function of the crank angle, the piston is shown to initially be at the bottom dead center. 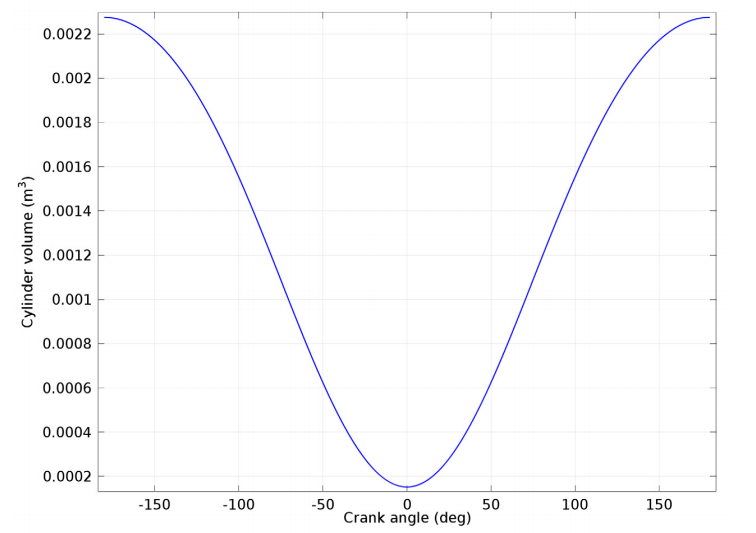 This corresponds to a crank angle of -180°. The angle is therefore defined as zero at the top dead center. 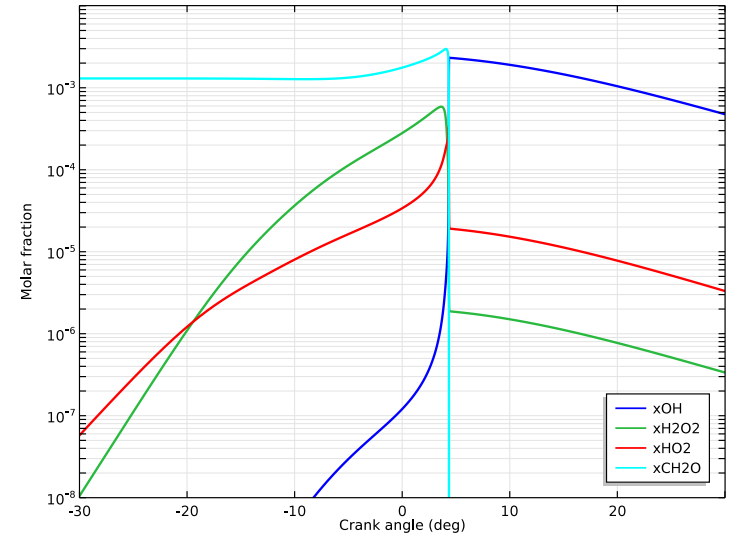 Plot depicting the cylinder volume (combustion chamber) as a function of the crank angle. We can begin by looking at our analysis of the cylinder pressure as a function of time when the mixture of methane and air undergoes compression and ignites. Starting at bottom dead center, the piston eventually reaches top dead center after 0.02 seconds. At an initial temperature of 400 K, the methane does not ignite. This is in agreement with the results from Ref. 1. Additionally, we observed that as the initial temperature increases, the induction delay, the time of which can be evaluated from the pressure gradient, decreases. Cylinder pressure as a function of time when the mixture is compressed and ignites. 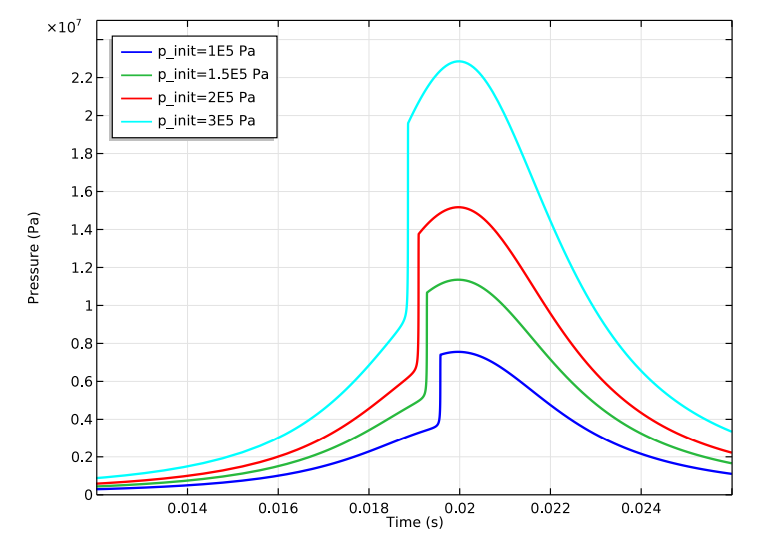 In the next plot, we can see pressure distribution when the initial pressure is varied from 1 x 105 Pa to 3 X 105 Pa. Here, the initial temperature is set to 500 K. As the initial pressure increases, the species concentrations in the mixture of fuel and air also increases. This results in the expected advancement of ignition. Plot showing the pressure distribution as the initial pressure is varied. Now that we’ve learned more about ignition behavior in HCCI, let’s move onto the challenge of ignition control. Combustion at the top dead center is suggested to be the optimal timing in this regard (Ref. 2). The simulation results shown above indicate that the mixture’s inlet temperature is a parameter that can potentially be tuned for ignition. There is one problem, though: proper timing often requires a relatively high inlet temperature. Such a high temperature can negatively impact the engine’s performance by decreasing the trapped mass and volume efficiency. Instead, we can improve ignition by adding a small amount of additives into the mixture of fuel and air (Ref. 3). Even at a relatively low temperature, the additives chemically activate the reaction mixture. At an initial temperature of 400 K, ignition can’t happen in a pure methane fuel; but the ignition process will be greatly facilitated by a small amount of a formaldehyde (CH2O) additive. 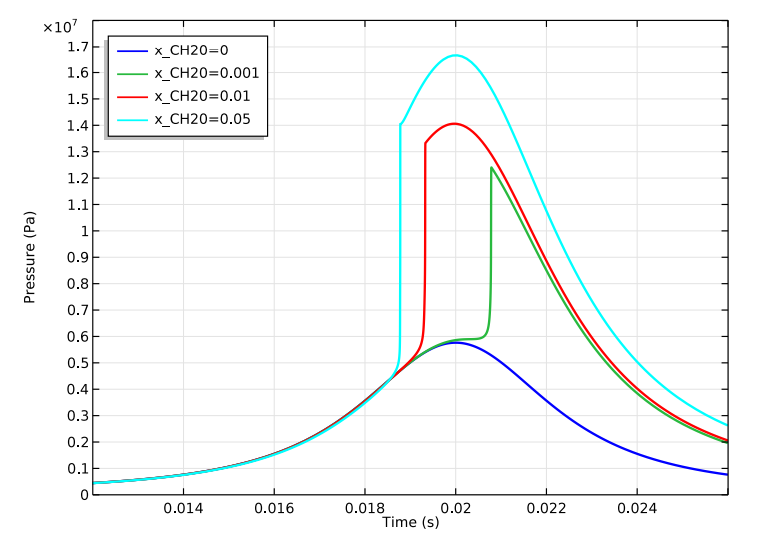 Simulation results show how small amounts of a formaldehyde additive facilitates ignition. In the presence of CH2O, we can clearly observe increased reactivity. But how can this be explained? The root of this heightened activity is the opening of a new chemical pathway, which prompts the formation of the hydroxyl radical. CH2O reacts with O2 to form H2O2, then H2O2 decomposes to reactive OH radicals. These radicals violently react with fuel molecules, which triggers the ignition. 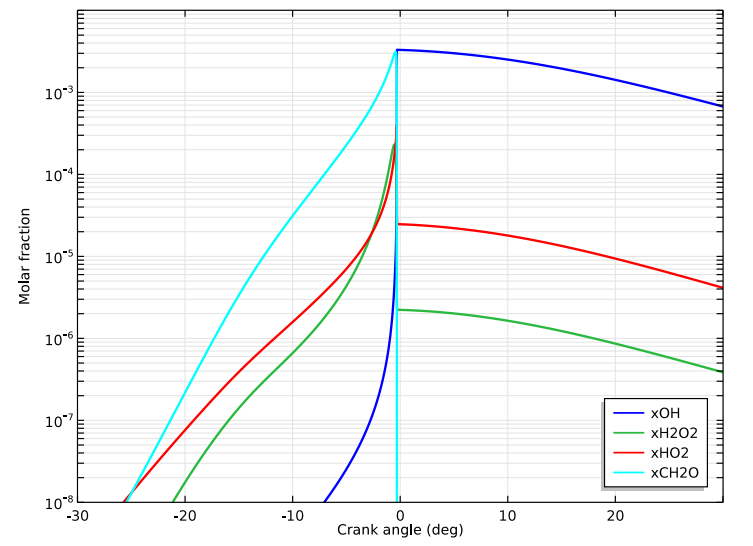 The following plots show selected species molar fractions as a function of the crank angle. In the first case, the reacting mixture contains 0.13% CH2O. In the second case, only pure methane is modeled. For each case, the conditions were tuned in such a way that the ignition happens near the top dead center, offering a point of reference to compare the species concentrations. When comparing the two sets of results, it is easy to see that CH2O helps stimulate the production of HO2 and H2O2. This in turn generates the production of OH radicals, which are crucial to prompting fuel ignition. Molar fraction plots with the addition of formaldehyde (left) and only pure methane (right). While HCCI technology has been around for many years, interest in its use has grown as fuel efficiency and lower emissions have become more important concerns in engine design. As we’ve showcased with our example model, simulation studies can serve as a powerful resource for better understanding the combustion process in HCCI engines and thus optimizing the degree of control over ignition timing. Such advancements further extend the potential of designing environmentally friendly engines to fuel in our future. S.B. Fiveland and D.N. Assanis, “A four-stroke homogeneous charge compression ignition engine simulation for combustion and performance studies,” SAE Paper 2000-01-0332, 2000. D.L. Flowers, S.M. Aceves, C.K. Westbrook, J.R. Smith, and R.W. 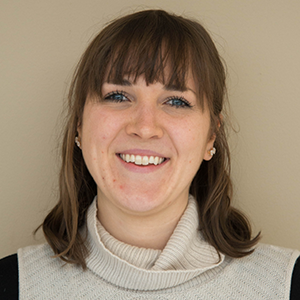 Dibble, “Detailed Chemical Kinetic Simulation of Natural Gas HCCI Combustion: Gas Composition Effects 11 | HOMOGENEOUS CHARGE COMPRESSION IGNITION OF METHANE and Investigation of Control Strategies,” J. Eng. Gas Turbine Power, vol. 123, no. 2, pp. 433–439, 2001. M.H. Morsy, “Ignition control of methane fueled homogeneous charge compression ignition engines using additives,” Fuel, vol. 86, no. 4, pp. 533–540, 2007.